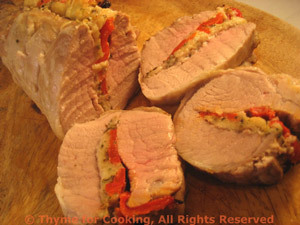 Pork Tenderloin stuffed, Pimiento, Prosciutto, Thyme for Cooking gourmet dinner. Heat olive oil in small skillet over medium heat. Add cumin and sauté for 10 seconds. Add shallots and sauté until tender and starting to brown. Reduce heat and continue cooking until well browned, 10 - 12 minutes total. Cut or tear Prosciutto into strips. Slice pimento or pepper into strips (if needed). Butterfly pork tenderloin - cut it in half lengthwise leaving 1/4 inch intact - so that you can open it like a book. Open it and give it a couple of whacks with a meat mallet so that it lies flattish... or pound lightly with the edge of a plate. You just want it to be flat and easy to work with. Lay Prosciutto on one side of pork about 1/8 inch from the edge. Top with the pimento, sautéed shallots, crumbs, thyme and cheese. Fold other side over and tie with kitchen string: cut five 6 inch lengths of string and wrap around pork and tie every 2 inches - making certain that you do one as close to each end as possible. Sprinkle with salt and pepper if using, place in a small roasting pan and roast in 400F (200C) oven for 25 - 30 minutes, depending on size, until done. Note: Slightly pink is perfectly acceptable for pork, actually, preferred, as it is much juicer. Pork is done when internal temperature reaches 155F. Slice and peak.